Living a cleaner, greener, more eco-friendly lifestyle can be an adjustment for some people. When you make a change like this, it’s important to take small, but permanent, steps. Here are some easy things you can do to cut down on the amount of waste you generate, while doing your part to leave a smaller carbon footprint on the planet. 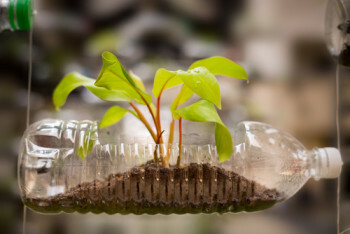 2-liter soda bottles can seem like a huge waste of resources. While it’s perfectly acceptable to recycle them, you can also turn them into something fresh for your home. Screw on the cap, and lay the bottle on its side. Cut out a panel, and on the opposite side of the panel drill a few small holes for drainage. Fill it with dirt, plant some seeds, and hang it in front of a window using some twine and a hook. You now have an elevated planter, which will help keep your air fresh, and add a touch of green to your place. Plastic hangers, while useful, will break over time with use. Again, you can just throw them into the recycling bin, or you can reuse those clips in other places. They’re ideal for holding bags of snack foods closed. They can also hold charger cords together, or act as refrigerator magnets with a little glue and a simple magnetized strip. For more great life hacks you can use to be more eco-friendly in your day-to-day life, simply contact us today!